1. Reduce – avoidance is the best policy. We try to minimise packaging by putting the whole delivery in one parcel, using environmentally friendly materials and using couriers with a reputation for carbon reduction where we can. We try not to make unnecessary journeys, and insulate our buildings well to reduce energy consumption. We’re also committed to reducing the energy usage of our products and are in the process of phasing out halogen bulbs for LED – which also have the benefit of lasting longer! 2. Re-use – where we can, we’ll re-use packaging to save using unnecessary materials. This may mean that the box you receive an order in has a few marks or excess bits of tape – but we would only use the box if it meant the product still arrived with you in perfect condition. We may also have less than perfect products – we’ll explicitly mark these in our sale section on our website so you know what you’re getting, but in our opinion we’d rather a perfectly good light found a good home, even if the packaging is damaged or there’s a slight imperfection. 3. Recycle – anything we can’t re-use gets recycled at an appropriate recycling centre – this includes boxes, paper, plastic and anything else. We aim to send as little as humanly possible to landfill. We are registered under the WEEE (Waste Electrical and Electronic Equipment) scheme, which aims to avoid unwanted electrical equipment waste. Many old electrical devices can be repaired or recycled, and disposing of them inappropriately can also cause damage to the environment. We are pleased to be able to offer a recycling service on your used equipment on a like for like basis – if you wish to use this service all you need to do is post or bring your old device to us when you purchase a new device. We are based at 36 Ferndale Street, Faringdon, Oxfordshire, SN7 7AH. We will then ensure that your old device is recycled or disposed of appropriately. 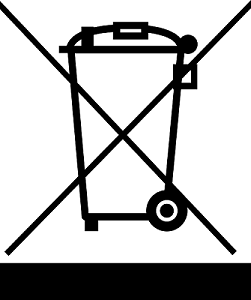 All recyclable equipment is marked with a crossed out wheelie bin symbol (see below).